Henny Penny pressure fryer servicing and refurbishing service, including cracked frytank rebuilds, computer control upgrades including Fastron & Computron conversions. Maintenance contracts and extended warranties. Collection and return service for your Henny Penny machines anywhere in the UK. General servicing and the supply of spare parts. Loan machines (subject to availability). Sales of fully reconditioned fried chicken equipment including pressure fryers (gas & electric), heated display cabinets, breading tables and chip fryers. Large selection of New Lincat B grade equipment including fryer, griddles, grills, Bain-maries, toasters, hot cupboards to name but a few items. 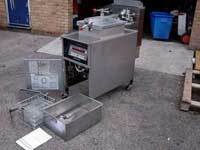 Supply of quality pre-owned & used catering equipment, sink units and stainless steel preparation tables. Lease finance arranged (subject to status). Bespoke fabrication works including made to measure prep tables, sink units, hot cupboards and extraction & ventilation systems. Price match discounts given where we endeavour to match or beat the best price you have been quoted for factory order items if we do not have a graded item available. Constantly changing stocks of equipment in our ebay store which is updated daily. Friendly, no obligation advice, given freely.